Validate your account: this is one way to show us that you own the site you're crawling, and gives you the right to bypass current site settings by increasing the crawl speed and using a virtual robots.txt file to replace the real one during a crawl. 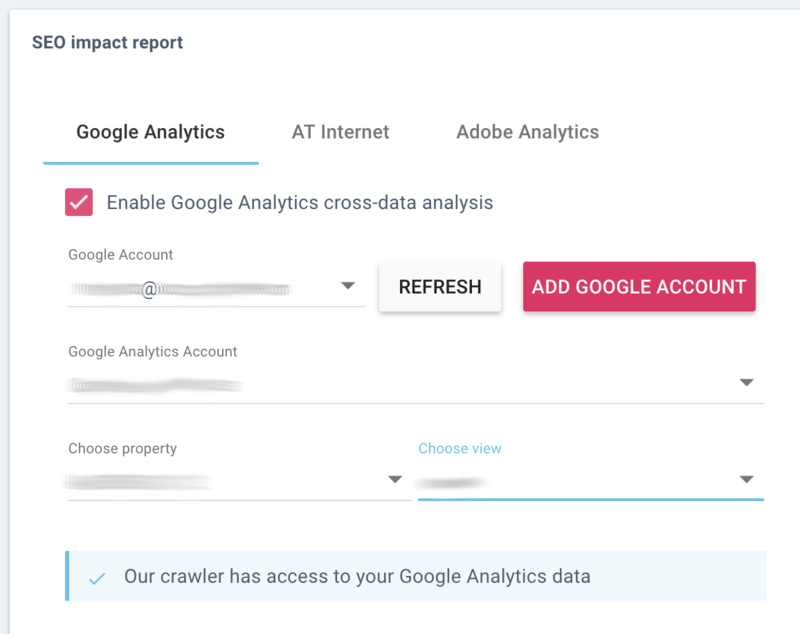 Add cross-analysis between crawl data and analytics data in the SEO Impact Report. This ties crawl data to real-word data on user behavior. Choose "Google Analytics" and follow the steps to provide the information we need to validate your project. From the project home page, lick on "Add data sources" in the "Enrich your crawls" section under "Tasks." Navigate to the "Google Analytics" tab and click "Add Google Account". This opens a pop-up window that allows you to connect to your account outside of OnCrawl. The only information we receive are the data your account shares with us after you've provided your login credentials. This means that you must authorize pop-ups in the OnCrawl app in order to connect your Google Analytics account. Indicate that you agree to share your Google Analytics data with OnCrawl. Scroll down to the "Analysis" section. Click on the "SEO impact report" tab to expand it. Tick the "Enable Google Analytics cross-data analysis" box. If you have already linked to it using one of the two methods above, you can click on the "Google Account" field to view a drop-down list of the known Google Accounts. Select yours. If your account is not already listed in this menu, click the "Add Google Account" button. Choose the view. This should be the view for the domain that uses the default grouping in Google Analytics. You must have access to this view. A message at the bottom of this section will confirm that our crawler has access to your data. If there's a problem, we'll let you know here. Now you can go ahead and launch your crawl. This data is available in Google Analytics and in OnCrawl. OnCrawl displays the data for the last 45 days. What type of analysis does OnCrawl show? This cross-analysis allow you to determine the metrics that have the most impact on your site, and the optimizations that can make the most difference for SEO traffic on your site.